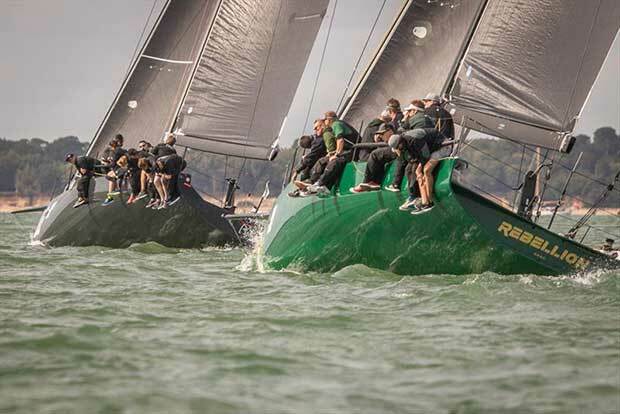 A change of course for the FAST40+ Class produced a shuffle in the results on the Sunday of the Wight Shipyard One Ton Cup. Two long courses were set, taking in navigation marks in the Solent, with long reaching legs as well as windward and leeward sections. 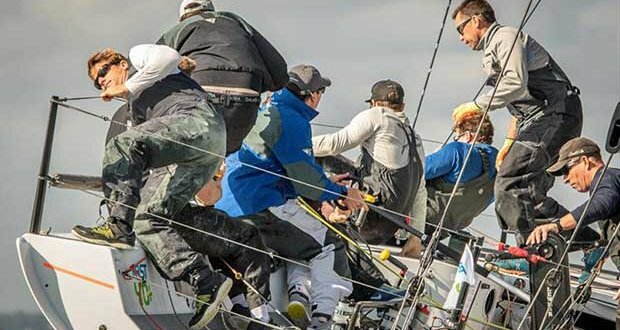 It was another good day for Niklas Zennstrom’s Rán, scoring a 1-2 to take a commanding position in the regatta. Tony Dickin’s Jubilee had a race to remember, taking the gun and the win in Race 6. Filip Englebert’s Elvis scored a 4-2 today, by a long way their best performance so far at the Wight Shipyard One Ton Cup. Peter Morton’s Girls on Film, holder of the One Ton Cup, did not have a good day. After getting shut out by Niall Dowling’s Pace at the start of Race 6, Girls on Film’s spinnaker blew out in Race 7. 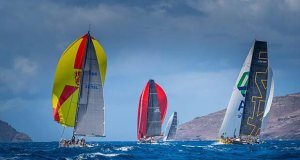 PRO Paul Jackson set Race 6 with a windward leeward first section and a triangular second section, designed to test the teams at every point of sail. The wind died towards the end of the race, and was shortened. Tony Dickin’s Jubilee called the change in gears perfectly, passing a number of boats to take the gun and their first win at the regatta. Rán was second, and Mike Bartholomew’s Tokoloshe took a well deserved third. Race 7 was held in west of the Brambles Bank with the wind picking up during the seven leg race. The two hour race featured both the Island and mainland shores, with a finish off the Royal Yacht Squadron at Snowden. Rán took the gun ahead of Filip Englebert’s Elvis. Stewart Whitehead’s Rebellion was third. By the start of Race 7 Filip Engelbert’s Elvis was already having a good day, scoring a well deserved fourth in Race 6. 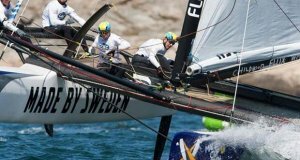 The day just got better for the Swedish team on Elvis, leading the FAST40+ fleet in the last race, before just losing out to Rán in the last few minutes. “Yesterday, we did make a few mistakes and we didn’t really get the results we are capable of, so we went out today determined to put that right,” commented Filip Englebert. The FAST40+ Class supper was held at the Royal Ocean Racing Club’s Cowes Clubhouse with the magnificent One Ton Cup on display. The winner of the prestigious trophy will be decided tomorrow, Sunday 16th September. 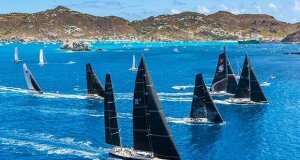 Up to three races can be held, with a first start scheduled for 1100.